These three Navajo saddle blanket weaving pillows are in great condition and are sold as a collection of three. Sold individually they are $950. Each and as a group they are 2295. for the group. All three have cotton linen backings. 35 x 18 larger pillow 37 x 17 Medium Pillow 35 x 15 Small pillow. These black and white Indian weaving pillows are in great condition and sold as a pair. The backs are in black cotton linen. This pair of Navajo Indian weaving saddle blanket pillows with leather trim. They both have tan cotton linen backings. Navajo Indian weaving bolster pillows from a saddle blanket. Two pillows have suede on them and two are without. Two pairs in stock. Two pairs for 1895, for all four. Beacon-style blankets were very popular in the first half of the 20th-Century. Often designed with striking graphic motifs, they were manufactured in bold, earthy colors. 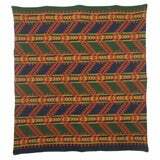 Large vintage Pendleton wool blanket Navajo style, wool blanket with large bold pattern in shades of red, green, purple, natural, tan and brown. Size: 58 W x 74 L.
Floral and trellis design hand painted and block printed on coarse hand woven cotton. Gujarat, India. Natural linen back. Invisible zipper. Feather and down fill.